Barberries. They’re indigenous to the UK you know. Apparently there is a barberry tree on Rye Common, but our customers won’t tell us where it is for fear we’ll go and harvest the lot. As with so much of our culinary heritage we have forgotten what to do with these little red berries, but back in the day (Mrs. Beeton’s times and before) we used to make jus and jelly out of them to go with rich game dishes. In Iran they are still used in great quantities in two – three classic dishes: zereshk pulao, khoresht-e-gheimeh khalal (which you will find in Veggiestan), and for stuffing things such as fish. There are a couple of golden rules for usage therein: firstly they’re really not good raw, and secondly they live up to their name by being full of barbs and occasionally stones – for this reason you need to pick through them and wash them carefully before use. make a coulis to go with sorbet – oh look, there’s a handy recipe below…. 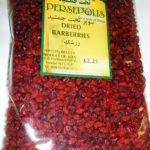 Put the barberries in a pan together with the water and all the other ingredients. Bring the contents of the pan to the boil and reduce by roughly half, stirring from time to time. Strain and press through a sieve and allow to cool. 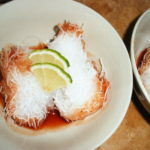 Drizzle artistically over faloodeh (Persian noodle sorbet) or tarts or anything you like really.